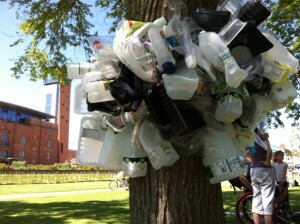 Why not take Transition Stratford’s Plastic Challenge? The idea’s simple. In Week 1, we shop as normal – but collect together every bit of plastic packaging that comes home with the shopping. We keep a note of how much packaging comes into our lives in a single week. In Week 2, we aim to avoid as much as possible of the throw-away plastic we brought home in Week 1. Different people do different things, but mostly we try to change the way we shop – in particular, seeing if we can avoid single-use plastic packaging. It isn’t easy, but everyone has some successes! Transition Stratford ran its first Plastic Challenge Fortnight at the end of May 2012 – and in 2013 the Plastic Challenge Fortnight ran from Monday 8 July to Sunday 21 July. Over 100 people signed up to take the Challenge at Transition Stratford’s stall at the Stratford River Festival on Saturday 6 and Sunday 7 July – gaining a free fabric bag to replace plastic carriers to help meet the Challenge. But if you missed the Fortnight … you can still take the Challenge at any time! Just pick two weeks when you can monitor how much plastic you buy – and then try to reduce it. You can keep in touch by e-mailing us at plastic@transitionstratford.com. Why take the Plastic Challenge? Plastic is durable, flexible and much lighter than most alternative packaging materials – so food and drink can be transported easily and kept longer. But plastic is also one of the worst of polluters, as it doesn’t easily degrade and can remain in the environment for a very long time. Plastic is especially damaging in our seas – up to a million marine animals a year are killed by plastic debris. Most plastics are also made from oil, which is a non-renewable resource. Around 4 per cent of total world oil production is used for food packaging – much of which is used just once before ending up in landfill. So the challenge is to cut down on plastic and cut down on its waste. To help you meet the Plastic Challenge, we have published tips and advice to give you ideas for ways to cut down on the amount of plastic you regularly use. And we’re collecting ideas, so contact us on plastic@transitionstratford.com if you’ve got a good idea to share with others.